assisted in answering the question: What are we in store for THIS year? Central America are nearly four-to-one in favor of mid-scale hotels over those in the luxury category. In many ways, the mid-scale segment is really the whole package by offering competitive pricing, high-quality service, and convenience. Also, those cities with easy in-and-out air service will remain in high demand. attendees alike. Being unique and offering special activities garner high marks and send the "meeting success" scores climbing. Finding venues that are unique to the area are often considered home runs. One-of-a-kind experiences such as a "behind-the-scenes" tours, or a "meet-and-greet" with a popular industry leader are popular. Also sought out are creative "street take-overs" and "pop-up events". Meetings that offer live streaming and other social media apps are hits as well by expanding the participation beyond just the attendees, but also to those back at the office. "Hotel Irvine&apos;s ‘Backyard&apos; is a popular space for meeting and party planners because it&apos;s a blank canvas waiting to be designed and converted into an exciting arena for a daytime BBQ, cocktail party, formal party and everything in-between. The Backyard includes a 6,000-square-foot pavilion, a 10,000-square-foot lush grass lawn, and an adjacent patio space. There are plenty of electrical outlets to create fun lighting such as strung lanterns, oversized floor lamps and audiovisual effects and plenty of space for furniture, staging and team-building outdoor games. 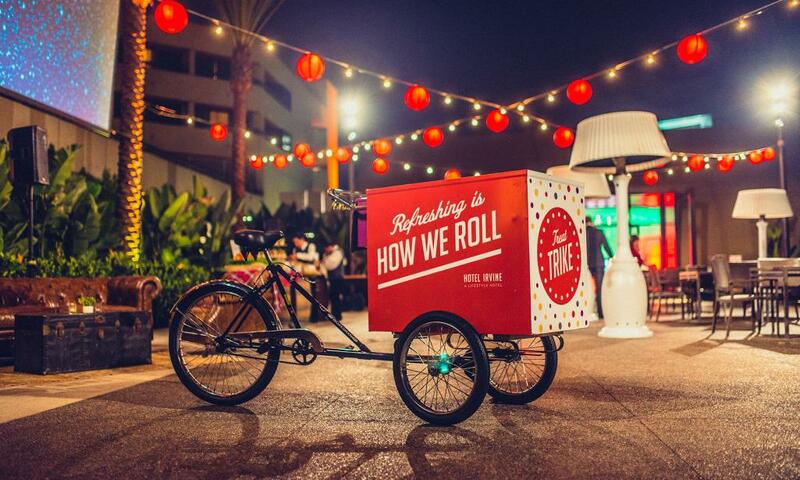 Our new retro-style Treat Trike is a hit with planners as it can be pedaled around The Backyard at events - delivering goodies and treats like ice cream, chocolates, and other items." tell a story and elicit lasting memories. In 2017, &apos;cookie cutter&apos; events are a thing of the past, as meeting professional are opting for venues that provide a canvas for big ideas to become a reality. As part of a multi-million dollar redesign, the Irvine Marriott introduced "Cannery Row". An outdoor venue built among shipping containers and other structures, Cannery Row is a pop-up space that expands upon the idea of personalization by actually taking attendees outside of the meeting room and placing them anywhere they would like to go. From a backyard barbecue to a wine tasting in Napa Valley, Cannery Row evolves to tell an event&apos;s unique story. We predict that ‘pop up&apos; capabilities will increase in popularity as planners are looking to truly make their events stand out." more time in the agenda for hands-on learning and interactive breakout sessions. Teams want to share information in a new way. According to meeting planners, the expectation is that these "experiences" will elevate the overall impact the meeting on an organization. So the pressure is on... full-throttle. With so many employees working flexible schedules and operating out of remote home-based offices, the desire to network and spend quality time interacting with fellow attendees is very important. These connections lead to new business, finding peer resources, and are becoming increasingly important as a component to the overall success of a meeting. consideration at all levels. This was also echoed in the 2017 American Express Global Meetings and Events Forecast. It is not just terrorism or active shooters, but cyber security, health concerns of contagious diseases, and other emergency situations that were not "top of mind"
Year after year, and study after study, Irvine repeatedly rates as one of the safest cities in the United States. This bodes well for meeting planners, attendees and spouses/guests who are often elated to hear their meeting will be held in Irvine, CA! Live video-streaming, Instagram and Snapchat are all changing the game. And not only for those in attendance, but those back home in the corporate/regional offices. Virtual and hybrid meetings are on the up-tick. Wider bandwidth needs will be in greater demand, similar to the needs of Wi-Fi which exploded in meeting public spaces as well as guest rooms just a few years ago. Apps are on the rise, and more, not less, are anticipated in the future. New apps and websites are useful tools for check-in, sharing information, but also for gathering data on attendee behavior and post-meeting analysis. Some meetings include voting in their programming---with the attendees using their mobile devices to vote on survey questions and thereby providing instant feedback to be shared in the meeting and in the moment! offsite participants in their social media platforms as well. That&apos;s why your team at Destination Irvine is promoting solution based incentives, like a technical production consultation with AKJohnston or a digital strategist certification through PCMA. When you come to Irvine, we help give planners a leg up in the digital race." Planners are citing tight lead times, with the most planning reserved for product launches and trade shows. However, another factor on the rise is a balancing act of meeting planner&apos;s charged with organizing multiple smaller meetings in addition to the "main event". With many hotel companies offering centralized sales models, this allows meeting planners to consider multiple properties at one time. The venue size, room rate, complimentary meeting space and discounted Wi-Fi are all high on the list in 2017. There continues to be much less willingness on the part of meeting planners to negotiate on service fees and cancellation penalties. Sharing is caring, and we are observing a continued increase in Uber, Lyft, various ride-sharing sites, as well as Airbnb and other short-term rental programs offering non-traditional accommodations. Globally, these are nibbling away at the more traditional travel standards. UberEvents, for example, was launched in 2015. This offers a prepaid option for groups and social events, such as weddings. (Now there is speculation that Uber may go public in 2017.) With social media and apps for attendees to engage prior to arrival, many are coordinating transportation and accommodations on their own. a small issue in Irvine and other cities across the country. Deirdre Michalski is a travel and culinary writer covering topics near and far. She explores new local restaurants, activities, interviews chefs, lifestyle adventures, the meetings market, spas and enjoys discovering intriguing international travel destinations and the oldest restaurants around the globe. Deirdre writes for her own web site, www.TastesAndTravel.com as well as other publications, including: Newport Beach Lifestyle Magazine, Visit Newport Beach, Visit Huntington Beach and Destination Irvine. She is an active member in two organizations: the International Food, Wine & Travel Writers Association (IFWTWA), and She's Wanderful- Women In Travel. When not tied to her ipad, or traveling, she can be found in her garden, the kitchen, researching a trip, or on the coastal bike paths. Visit her web site to learn more about "How to Do Machu Picchu Without Killing Yourself" and how to "Live Like a Local in Italy", adventures in the South of France, Budapest and Prague. This summer she will be exploring the Baltics on a cruise with its own Bon Appetit Cooking School on the ship!